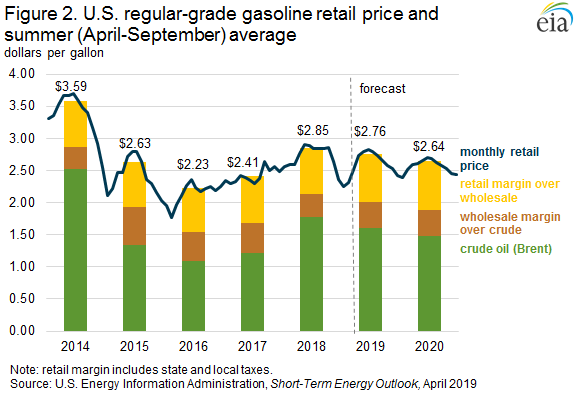 In the April 2019 update of its Summer Fuels Outlook, a supplement to the Short-Term Energy Outlook (STEO), the U.S. Energy Information Administration (EIA) expects the retail price of regular-grade gasoline will average $2.76 per gallon (gal) during summer 2019 (April through September). This expected average is down from both the 2018 summer average of $2.85/gal and the five-year (2014–18) summer average of $2.74/gal. Forecast retail diesel fuel prices average $3.09/gal this summer, down from an average of $3.22/gal last summer but still higher than the five-year summer average of $2.95/gal. EIA forecasts that gasoline and diesel prices will be lower this summer compared with last year primarily because it expects Brent crude oil prices will be lower than last summer (Figure 1). Because gasoline and diesel taxes and distribution costs are generally stable, changes in retail gasoline and diesel prices are primarily driven by changes in crude oil prices (Figure 2). EIA forecasts that the Brent crude oil price will average $67 per barrel (b) ($1.60/gal) this summer, compared with an average of $75/b ($1.78/gal) last summer. In the Summer Fuels Outlook, EIA forecasts that monthly average retail prices of gasoline will increase from $2.74/gal in April to a summer peak of $2.83/gal in June before gradually falling to $2.66/gal by September. EIA expects the gasoline crack spread (the difference between the wholesale price of gasoline and the Brent crude oil price) will average 41 cents/gal this summer. This gasoline crack spread would be 6 cents/gal higher than last summer but 3 cents/gal lower than the five-summer average from 2014 through 2018, in part, because U.S. gasoline inventories are expected to remain high. U.S. gasoline inventories in January 2019 exceeded the five-year January average by 11.2 million barrels. As a result, EIA's gasoline crack spreads averaged 9 cents/gal in January and February, the lowest level during those months since 2014. However, inventory levels recently fell to about 4 million barrels above the five-year average, putting significant upward pressure on wholesale gasoline margins, and March 2019 margins averaged 34 cents/gal (Figure 3). The increase from February to March was the largest increase in wholesale gasoline margins for March since at least 1994, but margins in March were still 3 cents/gal lower than the five-year average. EIA expects that domestic refinery production of motor gasoline, including gasoline blendstock output, will be 80,000 barrels per day (b/d) higher than last summer. 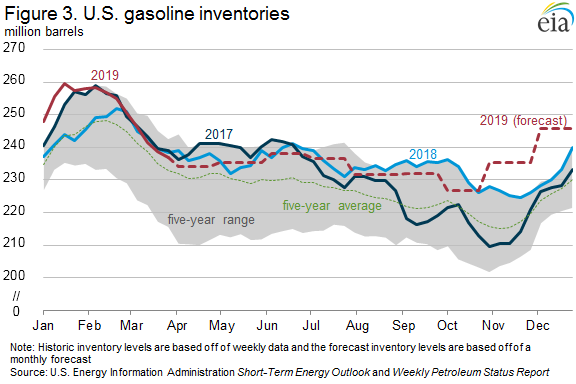 EIA forecasts that the United States will be a net exporter of total gasoline, including blending components, during the summer months, and export an average of 87,000 b/d from April through September in 2019. This summer would be the first time since 1960 that the United States was a net gasoline exporter for a whole summer. EIA forecasts motor gasoline consumption during the summer will average 9.5 million b/d, up 29,000 b/d (0.3%) compared with last summer's level and about the same as the record summer average set in 2017. Stocks are expected to end the summer driving season at 232.0 million barrels, about 7.6 million barrels lower than last year's level but 6.4 million barrels higher than the five-year average. 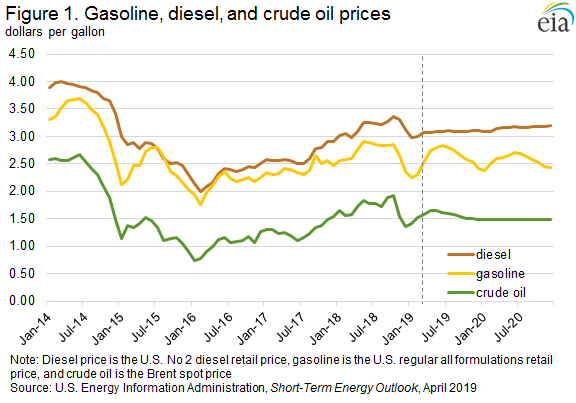 Retail diesel fuel prices are projected in the Summer Fuels Outlook to average $3.09/gal this summer, down from $3.22/gal last summer but still higher than the five-year average of $2.95/gal. Forecast wholesale diesel fuel margins average 48 cents/gal this summer, 5 cents/gal higher than last summer's level and 8 cents/gal higher than the previous five-summer average. 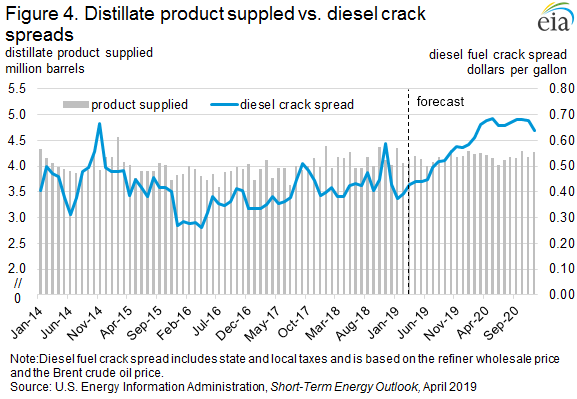 Diesel crack spreads are forecast to be higher than in recent years because of the continuing growth in both U.S. and global distillate consumption (Figure 4). EIA's forecast consumption of distillate fuel, which includes diesel fuel and heating oil, averages 4.1 million b/d this summer. This level would be up 20,000 b/d from last summer's consumption, which marked the highest U.S. summer distillate consumption since 2007. In the summer of 2019, EIA expects more moderate growth than last summer in the primary drivers of distillate consumption, including economic growth, industrial output, international trade activity, and crude oil and natural gas drilling activity, all of which contribute to higher trucking activity. Distillate inventories typically build during the summer season to prepare for the winter heating season. This summer, EIA forecasts that the build will average about 51,000 b/d, up from the 36,000 b/d build recorded last summer and higher than the five-year average summer build of 33,000 b/d. Forecast end-of-summer stocks are 137.2 million barrels—nearly the same as the 137.1 million barrels recorded at the end of last summer but 6.1 million barrels lower than the five-year end-of-summer average. EIA expects refinery output of distillate fuel to average 5.4 million b/d this summer, up 116,000 b/d from last summer. Projected net exports of distillate fuel average 1.3 million b/d this summer, up about 71,000 b/d from last summer. EIA expects that the International Maritime Organization’s (IMO) new regulations (IMO 2020) will cause some uncertainty in the diesel market this summer. Global refining and shipping industries are preparing to meet the new regulations that limit the sulfur content in marine fuels to 0.5% by weight, down from the previous limit of 3.5%. EIA forecasts that adjustments required by market participants to comply with IMO 2020 will put upward pressure on diesel refining margins. Although EIA anticipates that global petroleum markets will be most acutely affected by IMO 2020 in 2020, some effects could become apparent in mid-to-late 2019. The timing and magnitude of the effects resulting from IMO 2020 are highly uncertain. The U.S. average regular gasoline retail price rose more than 5 cents from the previous week to $2.75 per gallon on April 8, over 5 cents higher than the same time last year. The West Coast price increased over 15 cents to $3.42 per gallon, the Rocky Mountain price increased 7 cents to $2.54 per gallon, the Midwest price increased over 4 cents to $2.67 per gallon, the East Coast price increased over 3 cents to $2.65 per gallon, and the Gulf Coast price increased less than 1 cent, remaining at $2.45 per gallon. The U.S. average diesel fuel price increased more than 1 cent to $3.09 per gallon on April 8, 5 cents higher than a year ago. The West Coast price increased 5 cents to $3.59 per gallon, the Rocky Mountain price increased over 2 cents to $3.03 per gallon, the East Coast price increased 1 cent to $3.14 per gallon, and the Midwest and Gulf Coast prices each increased nearly 1 cent to $2.99 per gallon and $2.88 per gallon, respectively. U.S. propane/propylene stocks increased by 1.2 million barrels last week to 54.4 million barrels as of April 5, 2019, 9.0 million barrels (19.9%) greater than the five-year (2014-2018) average inventory levels for this same time of year. Gulf Coast inventories increased by 0.8 million barrels, and Midwest and East Coast inventories each increased by 0.2 million barrels. Rocky Mountain/West Coast inventories decreased slightly, remaining virtually unchanged. Propylene non-fuel-use inventories represented 11.5% of total propane/propylene inventories. Росстат: "О состоянии внешней торговли в январе-феврале 2019 года"